-Photo by Benjamin C. Tankersley for Baltimore magazine. 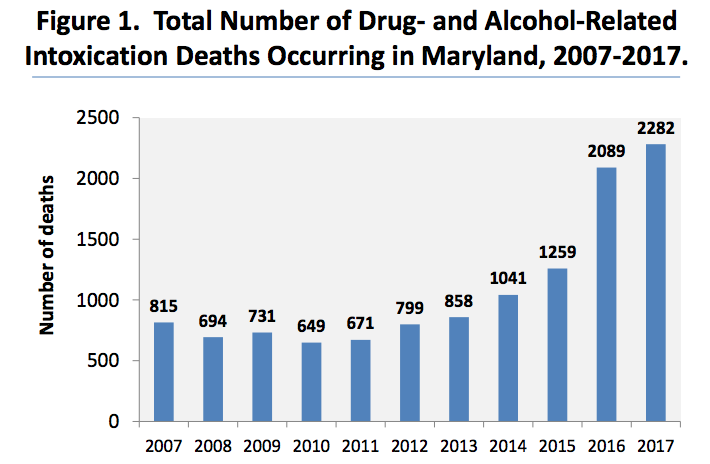 More than 2,200 Maryland residents died in 2017 from unintended drug and alcohol-related intoxication, setting an all-time mark for the state in the seventh consecutive year. Of 2,282 drug and alcohol-related deaths in Maryland last year, 2,009 were opioid-related, according to a report released Thursday by the Maryland Department of Health. Those numbers have more than tripled since 2011, when the number of opioid-related deaths in the state first began to rise. The statewide data from the first quarter of 2018—which shows a nearly 20 percent increase in unintended intoxication deaths over the same period last year—indicates the ongoing public health crisis is only worsening. Baltimore magazine chronicled the opioid crisis and its impact on Hagerstown and Washington County in our July issue. In Baltimore City, 761 people died from drug and alcohol related deaths in 2017, a significant increase from the 694 fatalities in 2016—and a seven-fold jump since 2011—driven by opioid-related overdoses. Baltimore is one of hundreds of jurisdictions in the U.S. that has sued pharmaceutical manufacturers and distributors of opioids for their alleged criminal roles in bringing the drugs to market. 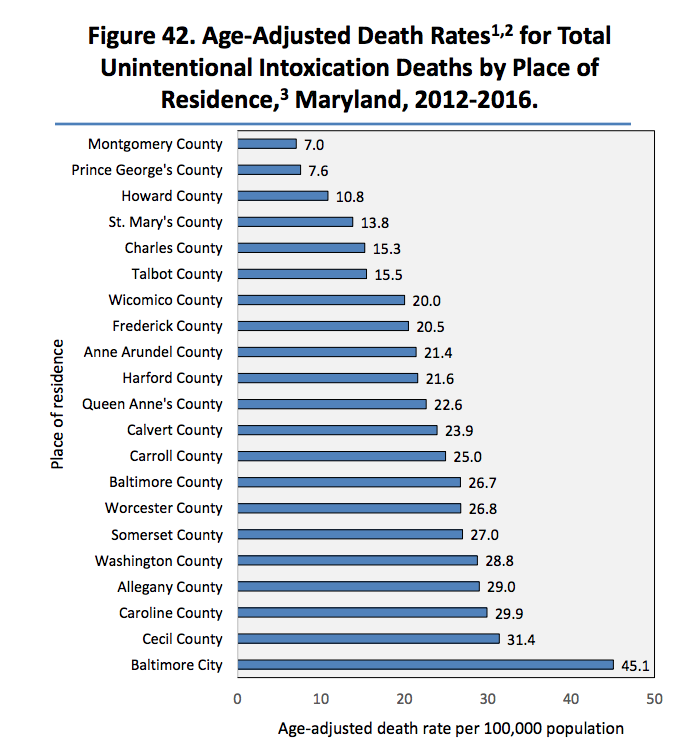 Baltimore City, by far, has the highest death rate for unintentional intoxications deaths in the state at 45.1 deaths per 100,000 residents. It is followed by Cecil County (31.4), Caroline County (31.4), Caroline County (29.9), Allegany County (29.0) and Washington County (28.8). Fentanyl, a powerful opioid painkiller, which is also made illegally and sometimes mixed with cocaine and heroin, continues to be one of the factors driving overdose fatalities. The new numbers and report quickly became campaign fodder in the current race for governor between incumbent Republican Larry Hogan and Democratic nominee Ben Jealous. The state Health Department called tacking the opioid epidemic “a top priority” of the Hogan-Rutherford Administration in a press release accompanying the report. On Friday, U.S. Rep. Elijah Cummings (D-MD) and U.S. Sen. Elizabeth Warren (D-MA) will hold a roundtable discussion with Baltimore community leaders on efforts to combat the epidemic. Earlier this year, Cummings and Warren introduced the Comprehensive Addiction Resources Emergency (CARE) Act, which is modeled on the Ryan White Comprehensive AIDS Resources Emergency Act. That act was enacted nearly three decades years ago with bipartisan support to boost federal investments and local decision-making to stem the HIV/AIDS epidemic.